SEO ranking or success factors? Home/SEO ranking or success factors? Moz have released their biannual findings from Moz’s Ranking Factors 2013 study. This follows on from the recent Search Engine Land Periodic table of Success Factors covered here a few weeks ago. Note the difference in wording here between SEO Ranking and SEO Success. So this is not an accurate analysis of what the search engine algorithm is but an observation on what the best performing (highest ranked) sites have in common. Michael Martinez made the following comment in a blog post on this topic recently. Google has over 200 different factors or signals that is uses in its algorithm, accompanied by more than 10,000 sub-signals. As it goes about its business these contributing SEO ranking items are in a constant state of flux with major and minor changes keeping SEO practitioners, theorists and commentators on their toes. The Search Engine Land Periodic Table offers you a good view of the bigger picture and is an invaluable aid in reviewing your web presence. Get these factors right and you will have covered 90% of your SEO checklist. However this list is not exhaustive and if you are already engaged with your optimisation you will see that factors such as the use of key words in alt tags, H1 v. H2 or the proximity of keywords to the start of your page title do not get a mention. If you have already got the basics covered and want to drill down further on where to apply your SEO effort then the Moz Study can help. Don’t forget that their correlation and analysis of the different factors is supported by opinion from some 120 SEO practitioners. Thats a lot of free advice and well worth paying some attention to. Below are two charts and comment from the most recent posting of the findings. Look at the %’s in the pie chart – make sure that you SEO efforts and resources are directed accordingly by concentrating on the areas that will give you most return. Links are still believed to be the most important part of the algorithm (approximately 40%). 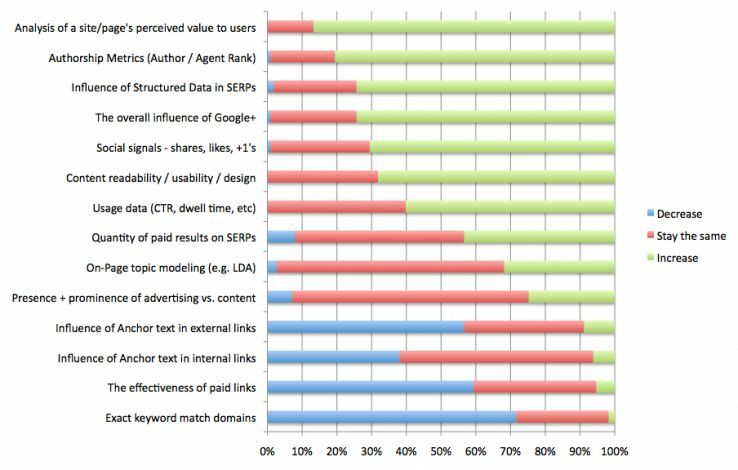 Keyword usage on the page is still fundamental, and other than links is thought to be the most important type of factor. Take these points as tips on what you need to do next to stay ahead of the game. The experts are really predicting a much bigger emphasis on: Content quality, Authority and interaction with visitors (top 7 items). So look wider and take a more holistic view of your approach – think content or inbound marketing and you will be well on the way to adressing these predicted changes in emphasis for Search Engine algorithms.